Transcranial direct current stimulation (tDCS) has become a widely used technique for reaching into a person's brain and altering the way in which it functions. Vanderbilt psychology Professor Geoffrey Woodman and graduate student Robert Reinhart have just published the results of a new study in the Journal of Neuroscience in which they found that tDCS stimulation of the mediofrontal cortex for a period of minutes can change one's ability to recognize and learn from error for a period of several hours. Our brains work on electrochemical currents passing through and between nerve cells. The patterns of neurons firing in the brain run the body, and are sometimes experienced as thoughts. The process of learning involves training the brain to prefer some patterns of neuron activity over others. A catchphrase for how this takes place in practice is "Neurons that fire together wire together." In other words, repeatedly exposing one's self to experiences with a common theme will make the corresponding firing patterns of the neurons more and more likely to show up in related situations. The process can of course be taken too far, as with the man with a hammer to whom every problem is a nail. 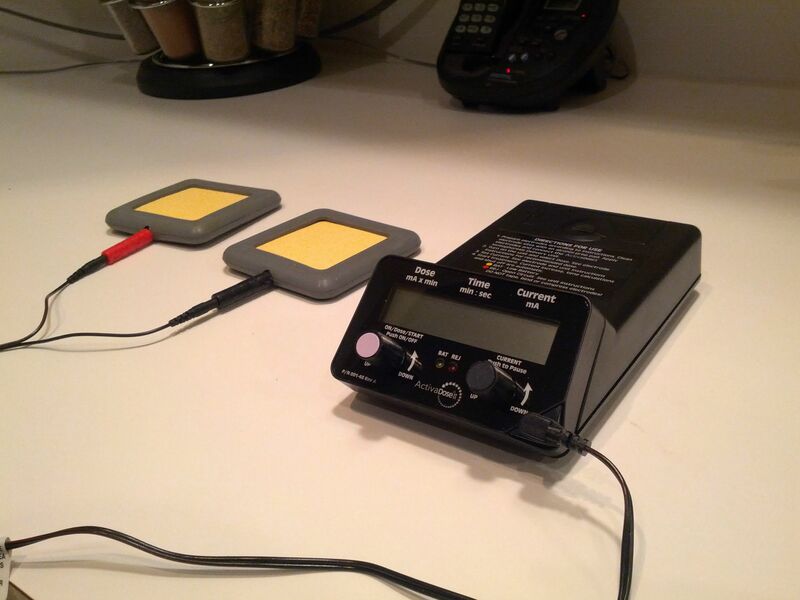 How does transcranial direct current stimulation (tDCS) work? tDCS works by sending a current, generally limited to less than 2 milliamps by a current regulating circuit, through one spot on the skull to another spot on the skin covering the skull. The spots are selected so the the current that actually passes through the brain (rather than bypassing the brain by conducting sideways through the skin or the skull) passes through the desired part of the brain. In the Vanderbilt study, the tDCS stimulus applied was 1.5 mA for a period of 20 minutes, with a period of at least 48 hours between stimulus sessions. A neuron fires when it receives a sufficiently strong stimulus, as shown on the left of the image above. Previous studies revealed that exposure to direct current alters the neuron's membranes. When electrons flow into the brain, also known as anodal stimulation, the neurons being affected by the current will reduce the firing threshold by a few millivolts, as shown on the right in the above figure. The result is that the neuron fires more often in response to whatever the owner is doing.The opposite condition, cathodal stimulation, increases the depolarization barrier by a bit, which make it more difficult for neurons in the affected region to fire, so many brain activities can become suppressed. This reduction in firing threshold makes it easier for the neuron to fire, but not too easy. That is, this configuration tends to make it easier to establish and strengthen new neural patterns, but not so easy that random patterns are strengthened. The therapeutic effect appears when new brain patterns have become habitual. In the Vanderbilt study, the 1.5 mA current was passed for a period of 20 minutes through the anterior cingulate cortex and the supplementary motor area of the brain. Contact was made using a 2 x 2 inch contact electrode on the scalp, and a 3 x 3 inch reference electrode on the center of the left or right cheek. (The experimental results were the same regardless of which cheek was chosen.) A commercial battery-powered, constant-current tDCS unit (a Mind Alive Oasis Pro) was used to generate and control the brain stimulation. The effect of the tDCS stimulation on the participants in the study was examined immediately after 20 minutes of either anodal, cathodal, or sham stimulation. The test was to push one of a pair of buttons identifying the color of a small square located toward the side of the field of vision. The buttons were on a small game controller, and the subjects were required to press the button of their choice using the right thumb, so that a substantial movement was necessary to record the choice. Color pairs were red/blue, magenta/green, and purple/yellow. (Study participants were tested earlier for color blindness.) The person being tested did not know which button was associated with which color; this had to be learned by trial and error. To make this more difficult, a button choice had to be made within 0.7 seconds of the appearance of the square. Making it still more difficult, if a black dot a bit smaller than the square appeared in the center of the field of vision after the square appeared, no button was to be pushed; the no-stop challenge. The dot would appear randomly in a third of the trials with delays ranging from 0.06 to 0.36 seconds after the square appeared. In the end, the test determines the accuracy with which a participant learned which button corresponded to which of two colors, how quickly they had to press the button for the choice to count, and how slowly they had to press the button to allow time for the possible appearance of the central dot, which told them not to push the button. The only guide they had for learning was a simple error signal (a large projected X appearing one second after the 0.7 sec response window closed lasting for one second.) This appeared when the participant got the color wrong, pressed the button later than 0.7 sec after the appearance of the square, or pressed the button before the central dot would appear (if it did), taking into account the time needed to process the "don't push the button" message and inhibit the response they were hurrying to make during the response window. The test is a series of rapid-fire responses to unknown external stimuli in a high-pressure and frustrating environment, making it a good approach for evaluating one's ability to learn from error, one of the main functions of the anterior cingulate cortex. The participant's EEG was being measured during the testing, with a focus on the event-related potential (ERP) from the brain region. There are two components of the ERP that relate to the brain's response to the performance testing: the error-related negativity (ERN) and the feedback-related negativity (FRN). Here negativity refers to a reduction in the ERP, and is in no way an emotional or cognitive description of the subject's thoughts. The ERN was discovered in 1990, and is one of the brain's responses to making an error in making choices. The signal also responds to the motivation of the subject. If a participant is told that the results of their choices are very important, the ERN will produce a larger change in the ERP than occurs if told to make the choices, but that the results really don't matter. Payment for correct choices have the same effect. The FRN shows a similar effect, but in response to being told that one has made an error. Both seem to be related to discovering errors in the brain's internal prediction of what is going to happen. In the first experiment, the sham (control) results established the size and duration of the ERP. In the figure above, the top set of graphs show the ERP vs time, with the duration and size of the ERN (errors) shown in yellow. The bottom set does the same, save that the duration and size of the FRN (feedback about errors) appears in yellow. Cathodal stimulation (at the left of the figure) has the rather remarkable effect of eliminating both the ERN and FRN. There is essentially no difference between the response to a correct test result and an incorrect test result. The result of anodal stimulation is completely different, with the size of the ERN and FRN easily doubling or more compared to the control results. The tDCS-induced change in the ERN and FRN is interesting, but does it reflect a real effect on subject performance? The figure above tells the story. Graph A shows the average error and the average response time for no-stop challenges for the three types of tDCS stimulation. The sham stimulation displays a control error rate of about 2.5 percent. The cathodal stimulation produced an error rate 2.5 times greater than the sham stimulation. In contrast, anodal stimulation resulted in an error rate about 2.5 times smaller than the control error rate. The response time for all three types of stimulation was 490 ms to within their error bars. Remember that these test results are for the same group of people following various tDCS treatments. Subjects given anodal stimulation do not respond faster, but more accurately. If you add 490 ms to the maximum 360 ms delay, you get 850 ms, or 150 ms after the selection window closes. Clearly the response time varies from this average, but there is no obvious way in which the apparatus can signal to the test subject how long the upcoming delay will be. It appears the brain will accept decisions that increase some types of error during its attempt to minimize the total error rate. Does a recent error change your behavior? If you were a test subject thinking about just having made an error in your choice in this test, and had remarkable conscious control on the level of a few milliseconds, you would probably decide to slow down your response a bit, to give you a bit longer to evaluate the situation, but not enough longer to overwhelm the improved results of slower response by missing the selection window too often. Interestingly, this is very close to the story told by Graph B. In this version of the data analysis, the researchers looked at how the response time and error rate of the subjects changed for the first no-stop challenge they see following having made an error in the last no-stop challenge. The sham stimulation gave control results of a 22 ms longer response time, and no significant change in the error rate for the statistics of this study. (This doesn't mean the error rate didn't change; rather that there isn't enough data to tell.) When cathodal stimulation was used, the response time only increased by 10 ms, but the error rate increased by about 60 percent from the average values shown in Graph A. The longest increase in response time (36 ms) was demonstrated by the anodal stimulation technique. The error rate displayed in the paper is very small, and appears to be about half of that shown in the Graph A analysis. It is clear from the results of the Vanderbilt study that the brain does a good job of learning responding to error and figuring out what to do about it (not a new result.) However, the extent to which tDCS stimulation of the anterior cingulate cortex can rather increase or decrease that capability is surprising, especially considering that the individuals who participated in the study already were functioning at a high cognitive level. There is a certain level of "chicken or egg" uncertainty about the direction of the correlation between the changes in ERN and FRN and the changes in behavior. The usual model is that tDCS stimulation changes the excitation threshold of the neurons in the ACC, and that changes the subject's ability to learn how to succeed at the test. An alternative explanation is the converse scenario, in which the tDCS causes a change in behavior (number of errors) through some other mechanism, and the changes in the ERN and FRN signals are caused by the changed behavior. The result is the same, what it tells us about the functioning of the brain is not. Will the near future include visions of tDCS units dancing through the brains of students and those of us who can't remember an appointment or a name to save our lives? Considering that tests of the influence of tDCS on a number of memory, motor, and cognitive functions report about the same doubling of ability, this seems a likely scenario. However, there is little evidence that tDCS can improve overall intellectual functioning, so don't expect to transform into a prodigy. The legal position on tDCS is not entirely clear. tDCS stimulators may already be illegal in Nevada if used to improve one's ability to count cards in blackjack. Rules and laws that constrain the practice of medicine may not apply to use for self-improvement, as medical practice is usually defined as efforts to return a patient to normal health, not to improve one's natural abilities. However, this is a grey area in medicine and in law. The US Food and Drug Administration (FDA) has approved use of the tDCS technique by medical researchers for research, but appears nowhere near considering even early-stage clinical trials. The FDA also considers a tDCS device to be in Class III, a rating applied to the most risky medical devices. To put this into perspective, all radiology medical devices, from neutron radiation treatment generators to x-ray machines to high-energy particle accelerators for treating inoperable tumors, fall into FDA Class II. These machines can actually kill. As no side effects have ever been proven for tDCS beyond the occasional electrode rash, the Class III rating seems a bit over the top. Despite these obstacles and others that may appear, Joe Citizen can have tDCS technology given only a 9 volt battery, a 1 to 2 ma current regulator diode (about US$2 at major electronics suppliers), a bit of wire, and something (wet sponges seem to be popular) to use as electrodes. About five dollars and half an hour of fiddling puts one in the game. In the end, tDCS is likely to be an extremely difficult genie to shove back in the bottle.